A black and white photograph of the new aerial ladder fire truck. This aerial ladder fire truck, the first owned by the Whitby Fire Department, was purchased in 1973. It is positioned in front of the main fire hall at 201 Brock Street South. 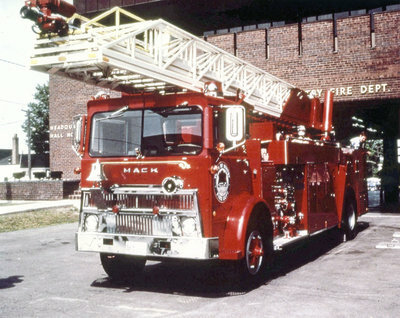 Aerial Ladder Fire Truck, 1973, Photographer Unknown. Whitby Archives 08-005-082.